Ever tipped your server before? Ever gotten a new tattoo? And when it was time to pay up, you added a little cash for the artist? Ever gone to a bar, heard a local band rock out, and tossed a few bucks in their hat? Of course you have. You’re cool like that. You’re a decent person. You recognize quality when you see it. So why not do something even easier (and cheaper) when you buy a piece of art, a book, or really any creatively-made material from Amazon? After deep research across a vast consumer base (aka: asking a few people who read my books) I think I’ve arrived at the reason. It’s understandable. You’ve just hung an awesome new slab of art on your wall. You’ve just read a kickass story. You’ve just picked up a fantastic new handmade-from-real-human-bones necklace. You think to yourself, ‘Damn. I love this thing,’ and you go about your life. After all, you’ve already paid for it. Your role is finished, right? What if I told you, in about 60 seconds, you could make a much larger difference in the artist’s life than the 7% profit they might have made from selling you that awesome stuff? What if I told you that an Amazon review is about 1,000% times more important than the $0.35 cents they made on the sale? It’s true. Because really, 60 seconds is about all the time it takes to write up an honest Amazon review. “How do I do it?” you ask. 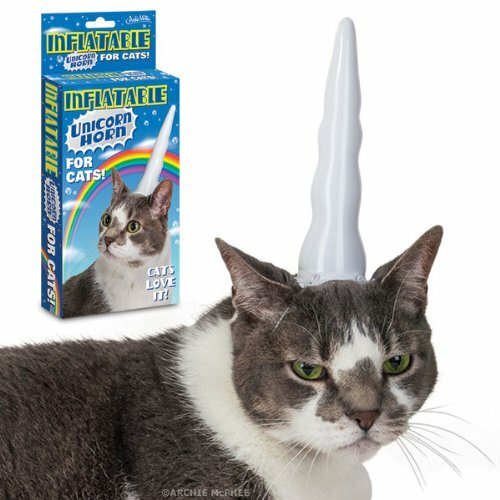 Because EVERYONE needs an Inflatable Unicorn Horn for their cat. See that juicy lil’ button that says ‘Write a Review’? Good. Click it. Next up, you’ll arrive at a Sign-In screen. Take 4 seconds to log in and click the ‘Sign in using our secure server’ button. Boom. Whew. 10 seconds in and I’m exhausted. You’ll immediately be sent to the screen below. It’s really, really easy from here on out. You click the stars to tell Amazon how awesome/not awesome your new purchase is. And then you type in your review. Amazon recommends 75-500 words. Don’t feel like typing that much? Cool. Just offer two little tiny sentences about how this art, book, skull-necklace, or cat unicorn horn made you feel. And just like that, you’re done. It was that easy. Now just hit ‘Submit.’ Research proves you’ll die 700% happier for knowing you helped an artist, author, or cat unicorn horn manufacturer. Don’t ever mention knowing the artist or author personally, even if you do. Big turnoff. Review the product. Not the maker of the product. Even 3 and 4-star reviews are awesome! To test my theory that reviews typically take no longer than 60 seconds, I just reviewed two books on Amazon. For real. One took 48 seconds. The other took 58 seconds. Which means, in less than two minutes, I helped two artists out, gave them more exposure (more reviews earn WAY MORE Amazon page views) and slapped a virtual ‘tip’ on the artists’ tables worth its weight in gold for their future. Tagged Book Reviews, Doing the Right Thing, Helping Artists, Making your Mark, Writing Art Reviews.